75-ohm characteristic impedance means that these plugs not only transmit superb analogue signals but also outstanding digital audio and video signals. The transmission bandwidth is 1 GHz. Eddy currents occur in metal components close to where alternating currents flow. These currents can result in major signal distortions. The WBT-0110 Ag is designed in such a way that eddy currents do not occur at all. The contact elements of the plug are made of high-purity silver, the best electrical conductor of all, in order to ensure optimum signal transmission. The metal is naturally passivated so that the surface does not corrode or migrate and impair contact quality. The clamping mechanism, which works in the same way as the chuck device in a drill, firmly clamps the outer contact against the RCA socket. The high clamping pressure not only guarantees a secure connection but also minimises transition resistance. The pressure wedge between the contact and the sleeve is made of plastic, which means that the sleeve is completely insulated and cannot influence the signal. In addition, any size variation in the outer contact of a socket is compensated for, thereby ensuring a perfect fit. The central contact element can be removed to facilitate cable soldering. WBT provides a special nextgen tool for this purpose to OEM users. WBT recommends the surface friendly silver solder WBT-0800 (see also solder connection). A Torx screw provides reliable cable strain relief. 75-ohm characteristic impedance means that these plugs not only transmit superb analogue signals but also outstanding digital audio and video signals. The transmission bandwidth is 1 GHz. Eddy currents occur in metal components close to where alternating currents flow. These currents can result in major signal distortions. 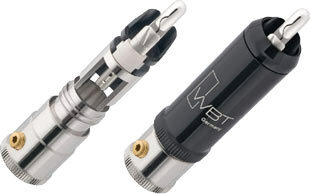 The WBT-0110 Cu is designed in such a way that eddy currents do not occur at all. The contact elements of the plug are made of high-purity copper, one of the best electrical conductors, in order to ensure optimum signal transmission. The metal is nickel-free gold-plated so that the surface does not oxidize and impair contact quality. The clamping mechanism, which works in the same way as the chuck device in a drill, firmly clamps the outer contact against the RCA socket. The high clamping pressure not only guarantees a secure connection but also minimises transition resistance. The clamping sleeve is designed with two sections so that the front section moves freely as the rear section is turned. This eliminates the risk of torsional strain on the contact elements. The pressure wedge between the contact and the sleeve is made of plastic, which means that the sleeve is completely insulated and cannot influence the signal. In addition, any size variation in the outer contact of a socket is compensated for, thereby ensuring a perfect fit. The central contact element can be removed to facilitate cable soldering. WBT provides a special nextgen tool for this purpose to OEM customers. WBT recommends the surface friendly silver solder WBT-0800. The basic element having influence on the sound quality of WBT-0102 Ag is the Central Contact Unit which has been developed exactly the same way as for the plug model WBT-0110 Ag: minimal mass of signal conductors made of fine silver. Silver was chosen because of being the best electrical conductor which is the absolute guarantee not only for an ultra rapid signal transmission, but also for an excellent fine resolution. The signal conductors are passivated and thus best possibly protected against corrosion or mirgration which would affect the contact quality. 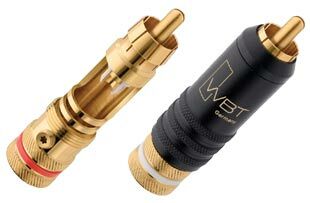 WBT-0102 Ag lies with its transmission bandwidth of up to 200 MHz far in excess of the transmission bandwidth of conventional RCA plugs. The centre pin is slotted and slightly bent up and thus guarantees with its firm spring feature a long-lasting secure electrical connection with lowest transition resistance possible. 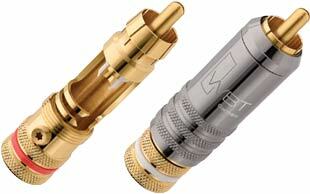 The body element is made of brass (platinum plated) in order to accept rigid and particularly thick cables. The metal connector body is of course electrically uncoupled from the Central Contact Unit und is made of as little metal as possible so that also WBT-0102 Ag is free from eddy current to a large extent. Other than for digital outputs it is very important for phono outputs (record players, microphones) to have a good shielding against electromagnetic interfering fields. The undesirable interspersions can be very high depending on the nature of the devices and first of all on what they are surrounded by (cellular phones, computers etc.). WBT-0110 nextgenTM pure was designed as the perfect RCA plug for digital links, the new WBT-0102 Ag optimizes analogue connections. WBT-0102 Ag has the more conductive and with the minus contact element connected brass clamping sleeve in order to provide the necessary electromagnetic shielding. For soldering your cable WBT and Strassacker recommends using silver solder WBT-0800 (see also solder connection) which is gentle on the surface. Torx screw provides a secure cable strain relief. (The position of the Torx screw on the plug´s round shaft can vary depending on the production process). 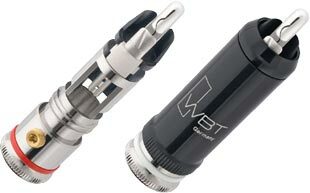 The basic element having influence on the sound quality of WBT-0102 Cu is the Central Contact Unit which has been developed exactly the same way as for the plug model WBT-0110 Cu: minimal mass of signal conductors made of fine silver. Copper was chosen as one of the best electrical conductors which is the absolute guarantee not only for an ultra rapid signal transmission, but also for an excellent fine resolution. The signal conductors are gold plated (nickel-free) and thus best possibly protected against oxidation. which would affect the contact quality. WBT-0102 Cu lies with its transmission bandwidth up to 200 MHz far in excess of the transmission bandwidth of conventional RCA plugs. The body element is made of brass (gold plated) in order to accept rigid and particularly thick cables. The metal connector body is of course electrically uncoupled from the Central Contact Unit und is made of as little metal as possible so that also WBT-0102 Cu is free from eddy current to a large extent. Other than for digital outputs it is very important for phono outputs (record players, microphones) to have a good shielding against electromagnetic interfering fields. The undesirable interspersions can be very high depending on the nature of the devices and first of all on what they are surrounded by (cellular phones, computers etc.). WBT-0110 nextgen™ pure was designed as the perfect RCA plug for digital links, the new WBT-0102 Cu optimizes analogue connections. WBT-0102 Cu has the more conductive and with the minus contact element connected brass clamping sleeve in order to provide the necessary electromagnetic shielding. The basic element having influence on the sound quality of WBT-0152 Cu is the Central Contact Unit which has been developed exactly the same way as for the plug model WBT-0110 Cu: minimal mass of signal conductors made of highly pure copper. Copper was chosen as one of the best electrical conductors which provide not only an ultra rapid signal transmission, but also an excellent fine resolution. This metal is of course nickel-free gold plated so that the surface does not oxidize which would affect the contact quality. WBT-0152 Cu lies with its transmission bandwidth of up to 200 MHz far in excess of the transmission bandwidth of conventional RCA plugs. The body element is made of brass (nickel-free gold plated) in order to accept rigid and particularly thick cables. The metal connector body is of course electrically uncoupled from the central contact unit und is made of as little metal as possible so that also WBT-0152 Cu is free from eddy current to a large extent. Other than for digital outputs it is very important for phono outputs (record players, microphones) to have a good shielding against electromagnetic interfering fields. The undesirable interspersions can be very high depending on the nature of the devices and first of all on what they are surrounded by (cellular phones, computers etc.). 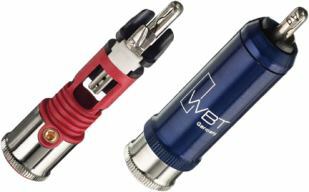 WBT-0110 nextgen™ pure was designed as the perfect RCA plug for digital links, the new WBT-0152 Cu optimizes analogue connections. WBT-0152 Cu has the more conductive and with the minus contact element connected brass clamping sleeve in order to provide the necessary electromagnetic shielding. For soldering your cable WBT recommends using silver solder WBT-0800 which is gentle on the surface. The clamping mechanism, which works in the same way as the chuck device in a drill, firmly clamps the outer contact against the RCA socket. The high clamping pressure not only guarantees a secure connection but also minimises transition resistance. In addition, any size variation in the outer contact of a socket is compensated for, thereby ensuring a perfect fit. The metal parts are made from a special copper alloy and are 24 carat nickel-free gold-plated to prevent oxidation, which could negatively impact on contact quality. The insulation within the connector is made from heat resistant Teflon*, a distinct advantage when soldering connection cables, particularly when working with the higher soldering temperatures of lead-free solder. WBT recommends the surface friendly silver solder WBT-0800. A Torx screw provides reliable cable strain relief on the cable. WBT-0150 is constructed in the same way as the WBT-0101 but can accept cables up to 11.3 mm diameter. The insulation within the connector is made from heat resistant Teflon*, a distinct advantage when soldering connection cables, particularly when working with the higher soldering temperatures of lead-free solder. WBT recommends the surface friendly silver solder WBT-0800 (see also solder connection). WBT-0144 is the midline version of the WBT-0101. The metal parts are made from a special copper alloy and are 24 carat gold-plated to prevent oxidation, which could negatively impact on contact quality. 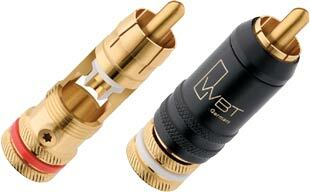 WBT-0147 is a shorter and slimmer version of the Midline RCA plug WBT-0144. It is particularly suitable for thin cables with a diameter of less than 7.5 mm and/or narrowly spaced unit-side RCA inputs. Despite being far smaller, the WBT-0147 possesses all the strengths of the WBT-0144 in terms of both contact quality and mechanical properties. Despite the limited space, the WBT-0147 can be soldered with ease. The solder connection for the positive pole is on the front side, the connection for the negative pole on the rear. The poles are kept separated by Teflon* acting as a dielectric, an advantage when the connecting cables are soldered, even with the higher soldering temperature of lead-free solder. WBT recommends the surface friendly silver solder WBT-0800 (see also solder connection).